The month of April is known for many things in DC, the kick off to tourist season, the Cherry Blossom Festival, and now National Grilled Cheese month! Don’t get me wrong, DC did not create this wonderful month of melty cheese and crispy bread, but you can bet that it will be celebrated, at least by some of us. 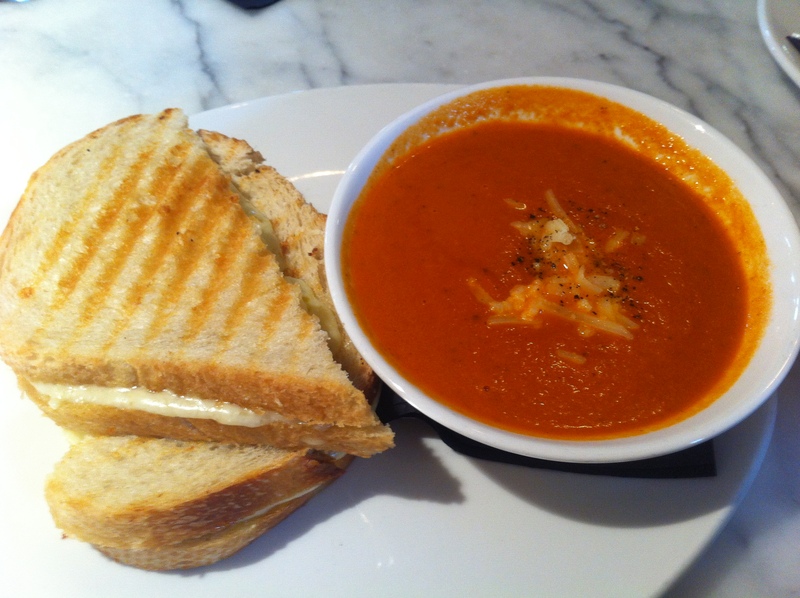 In light of this wonderful month of celebration the hubs and I popped out for what I consider to be the best grilled cheese and tomato soup combo, the Grown-up Grilled Cheese & Tomato Soup, at Cheesetique (not going to lie, their mascot may have the best calves I have ever seen on a logo). Now I know I have written about these fine, fine purveyors of cheese before, but they deserve it. Not only is their food delicious but their staff is kind, and quick, and happy to discuss your options with you, or give you a quickly nibble to help you make up your mind (not unlike their colleagues manning the cheese cases up front). The beauty of this melty sandwich and soup combo is that the soup itself is the perfect texture, and flavor, to serve as both a soup AND a dip for the grilled cheese. I often find that people tend to make tomato soup in the consistency of a light tomato sauce, and that is no good, you want your soup to be light and almost fresh tasting so it does not cover the deliciousness of the melted cheese. You also have to be very careful to get the right cheese in your grilled cheese (and if you say Kraft Singles I will smack you upside the head, it only melts nicely because it is made of fake). The Cheesetique folk use a lovely Prairie Breeze Cheddar from the fine cheese makers at Milton Creamery in Iowa. It both melts like a dream, but also has a mellow yet sharp taste that pairs well with the sourdough it is melted between. This soup and sandwich combo with a glass of wine, or a mimosa if you are so inclined, may be the perfect Sunday lunch!